Tai Tamariki Kindergaten have written this great article for the forthcoming ecARTnz magazine about their creative response to the two China exhibitions held recently at Te Papa. Our curators, Rebecca Rice and Justine Olsen were both blown away by the children’s work. I am sure you will be too! Tai Tamariki Kindergarten is currently awash with colour as we display the creations of our children in response to the recent Shi Lu and Throne of Emperor exhibitions held at Te Papa Tongarewa. Our children visited both exhibitions many times over and were exposed to various precious Chinese cultural artefacts, artworks and were given the opportunity to develop new cultural and historical understandings. These exhibitions have provided both our children and adults with many shared learning opportunities and the teachers have loved responding to the diverse individual interests that emerged for many of our children. The children were particularly interested in visiting the exhibition of the Chinese artist Shi Lu. They noticed how his art changed greatly over the period of his career and through China’s political unrest. The children asked why his art looked so different at the start and the finish of the exhibition. We had discussions about how Shi Lu may have been feeling through the different periods of his life. These talks of Shi Lu’s life and feelings made some real connections with our children as they saw him as an artist and a person. They soon started talking about when they were feeling good and feeling ‘badder’. Some of the children expressed how painting when they were feeling good meant art that featured colours, flowers, dolphin, a dog and really fresh air. When we discussed how we would paint feeling bad the children responded with black, like war and sad circles. We are a creative bunch and really valued these emotional recognitions and responses to the paintings through the eyes of our children. Very soon attention was drawn to the unusual types of brushes Shi Lu used and also of the slow and deliberate way he painted. We started to try out different tools back at kindergarten and a plan was made to make our own Shi Lu inspired creative brushes and painting tools to experiment with our brush strokes. A mix of faux hair, lavender, feathers, muka, and twine was used to create the tips of the brushes. We had a great time exploring new materials and old materials in new ways and we drew lots of inspiration from the Shi Lu exhibition, reference book and video. Children were able to explore different ways of binding their brushes so that the ends didn’t fall apart and also experiment with the thickness, length and stiffness of the resources to determine the mark making effects on paper. The paintbrushes were created and the teachers commented on the beauty of the brushes as taonga themselves, even before they were set to work for their chosen purpose of creating our paint and dye artworks. 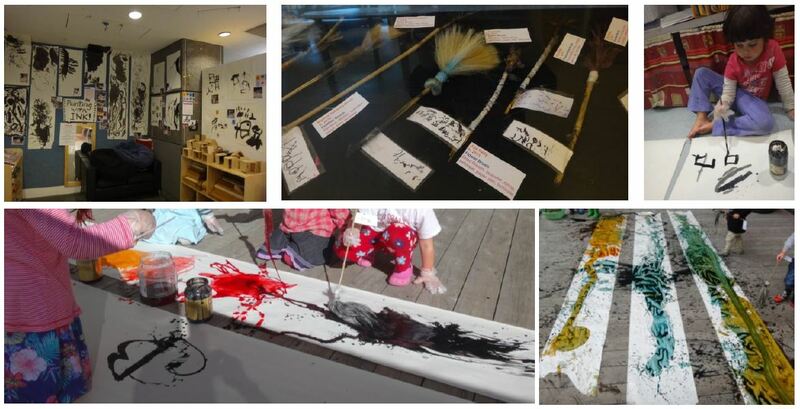 Children of all ages were able to experiment in both small and large scales with the brushes and our younger ones really loved running and flicking dye up and down rolls of paper laid out on our deck. Some of our older children began to experiment with the Chinese symbols that they were seeing upstairs and the teachers began to fill the kindergarten with lots of images and further provocations for learning in response to this. You can now see our children’s artwork displayed across our ceiling and walls and the precious brushes are on display in our Tai Tamariki display case. It is important to us at Tai Tamariki that our environment reflects the interests and learning of our children and that they see how much we all value their mahi and contributions. Perhaps our environment is also a visual reflection of the powerful provocation that the trips into the museum exhibitions and galleries can provide. Thank you for sharing Tai Tamariki – you are truly inspirational!